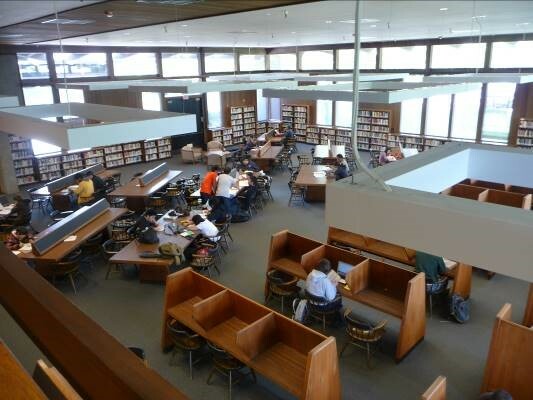 Foothill College Library Renovation – $12 million library renovation with infrastructure and controls upgrade. The existing constant volume reheat system utilized the wooden attic as return air plenum and operated at a high noise level. With the limited space in the attic and complex structural condition, an all air VAV reheat system was determined to be not feasible. Considering the limited available mechanical space, potential stratification during heating for the 20’ high ceiling area, and the requirement of improved acoustic performance of the new mechanical system, Gayner Engineers developed a solution that utilized a modern high efficiency VAV system for the low ceiling area and an Induction Beam System, which is a modified chilled beam system, for the high ceiling area. While chilled beams are not an ideal system for the rather dry and mild weather in the Bay Area, the induction beam system offers the advantages of not requiring a separate chilled water distribution with higher operating temperature, superior acoustic performance in a library environment, and the capabilities of handling high ceiling cooling and heating. .